Miranda Richards adored both her high-flying job and her family. The dilemmas she faced inspired the brilliant novel – now a Hollywood film – I Donâ€™t Know How She Does It. Itâ€™s not often that a Hollywood A lister gets a part because she looks like an unknown Norfolk mother of four, so Miranda Richards is understandably chuffed by her vicarious fame. With long, thin legs and a sharp but smiley face, Sarah Jessica Parker, 46, star of the new film, I Donâ€™t Know How She Does It, does indeed look rather like Miranda Richards. Her excitement at ordinary politeness from a star makes her sound like a complete backwoodswoman, but Richards is neither naive or untravelled. She may have swapped the City for the country, but thereâ€™s no hint of hayseed about the groomed figure in a little black dress, double-string necklace and high heels. Nor is her house chaotic and covered in dog hairs. I ask her how to describe the assemblage of high-ceilinged rooms around a central staircase, expecting to be told â€œGeorgianâ€ or â€œearly Victorianâ€. â€œSeveral people have called it ‘the most beautiful house in Norfolk,â€™â€ she replies, not boasting so much as stating a fact. 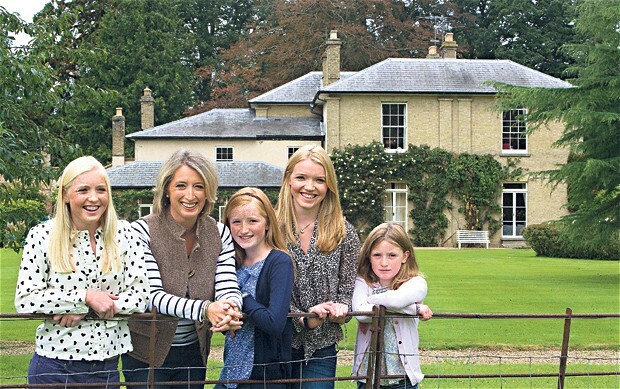 Surrounded by 40 acres of parkland, hers is a life anyone might envy. Married to Nick, an investment surveyor of commercial property, many women might not have wrestled long with the dilemma of whether to keep working ridiculous hours or see more of her family. Richards knows that she was â€œincredibly luckyâ€ to have a choice, but nevertheless agonised over the decision. The film, based on Telegraph columnist Allison Pearsonâ€™s 2002 best-selling novel of the same name, revolves around that decision and the dilemmas Richards faced a decade or so ago. Watching a preview, she says she found herself in floods of tears. â€œAt one point [Kate] sings ‘I love you a bushel and a peckâ€™ down the phone to her toddler. It reminded me of how young my children were and my need to break out of business meetings just to talk to them.â€ Back then, Richards was working 12-hour days for Henderson Global Investment as a fund manager, leaping on planes several times a week. She had Polly (now 16), Milly (now 14) and had just given birth to Theodora, known as Bee, 12. She loved her daughters viscerally, but she also loved her job. To tone up post-natally she joined forces with another mother in Islington, London, where they were living, to hire a Pilates teacher. That mother was Allison Pearson who at the time was hunting for a female character on whom to focus a series of columns for The Telegraph about a working mother. Kate Reddy was to be Bridget Jones for the woman who had found her man, cut back on the fags and chardonnay and started breeding. This womanâ€™s struggles were not about self indulgence but how to look alert (or even clean) in meetings after being woken repeatedly by a teething child. Her little white lies were not about which man she was or wasnâ€™t seeing but invented â€œmaleâ€ excuses for absences from an office where car problems were greeted with sympathy, while mention of a sick child was likely to mean banishment to the dreaded ”mummy-trackâ€™â€™ where a career was downgraded to just a job. The emotional core of the columns â€” which later evolved into the novel â€” was the divided heart of the woman who wanted to be in two places at the same time: in the office, earning money and praise, and at home being mummy. Pearson based Reddy on Richards, who fed her lively and often jaw-droppingly sexist details of the City culture which gave life to this modern everywoman. â€œCan we rely on you to attend board meetings with so many children?â€ one colleague asked. â€œIf you go on maternity leave, we canâ€™t guarantee your job back,â€ said another. It was the early days of email and Pearson received regular missives from the battleground. â€œShe came into my office sometimes so she could describe where I worked, and everyone was wondering what she was doing,â€ Richards remembers. As a working mother suffering from the same divided loyalties at the time, I found the book hit the spot â€” as did many other women, some of whom, apparently, gave up their jobs after reading it. The only parts that didnâ€™t ring true to me were the first page and the ending when Kate Reddy decides being a working mother doesnâ€™t work. The book opens with Reddy laboriously distressing shop-bought mince pies so she can pretend to the Mother Superiors (stay-at-home mums) that sheâ€™d done her bit for her daughterâ€™s school Christmas party. Did Richards really do that? â€œNo. I would have made them from scratch at 1am, pushing myself even further â€” and then burning them.â€ Thatâ€™s more likely. Shortly before the book came out, Richards had already scaled back to working three days a week, one of them from Norfolk. She gave up work altogether â€“ as Kate Reddy does â€“ when she was expecting her fourth child, Honor, now 8. â€œThe book tipped the balance for me. The children were in the bath when I told them. They were delighted, leaping about so there was water all over the floor. â€œI felt I had missed out on the babyhoods of the older girls so my plan, when Honor was born, was to take a picture of her every day during her first year.â€ It didnâ€™t work out like that. Capable, organised, ambitious women donâ€™t just stay at home to bake and take photos â€” or not for long (as Reddy also discovers). At the time, an astute contemporary of Richardsâ€™s at St Andrewâ€™s University â€” where she had read economics and politics, Arabic, logic and metaphysics â€” predicted that she would never be one of what Pearson calls the Domestic Disappeared. Sure enough, when the Richardses bought their current house, she was soon installing chickens, dogs, donkeys, a vegetable garden and a tennis court. Within months of Honorâ€™s birth, she was writing a pantomime for Beeâ€™s nursery school and helping local charities. What does she do now? Well, she explains, sheâ€™s a trustee of the Varrier-Jones Foundation which helps the Papworth Trust support disabled people, and is on the investment committee for her motherâ€™s old Cambridge college; until recently she was chairman of the governors of a local school; she also advises Norwich diocese on its investments and is secretary to the parish council. â€œTwo days a week I go up to London to help a friend who manages a global equities fund. Is that all I do, Bee?â€ she calls out to the child who is drawing behind the sofa. â€œYou look after us and the animals,â€ replies a disembodied voice. Unlike books, real stories about divided loyalties rarely have uncomplicated endings. But if a film were to be made in 10 yearsâ€™ time about Richardsâ€™s life now, I doubt it would make her cry.